The Houses of Parliament of South Africa are situated in Cape Town. The building consists of three main sections, with the original building completed in 1884, with later editions added in the 1920s, and again in the 1980s. The newest addition currently houses the National Assembly, being the lower house of the Parliament of South Africa, while the original building houses the National Council of Provinces, which is the upper house of the Parliament of South Africa. 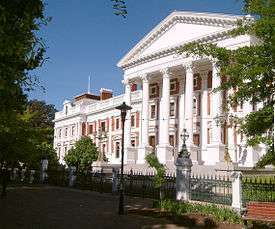 The original parliament building was built in a Neoclassical design incorporating features of Cape Dutch architecture. The later additions have been designed in such a way to blend in with the original building. The Houses of Parliament have been declared a National Heritage Site by the South African Heritage Resources Agency (SAHRA), being awarded grade 1 national heritage status, the highest status awarded by SAHRA. 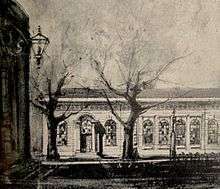 The Masonic Lodge which served as the venue of the first Cape Parliament. Queen Victoria granted permission for the establishment of a parliament in the Cape Colony in 1853. The first sittings were held in the Governor's residence, the Tuynhuys, after which sittings were held in the Goede Hoop Masonic Lodge. The then upper house was housed in the old supreme court building, which itself had been the slave lodge under VOC rule. Freeman's original elaborate plan for the new Parliament. MPs noted that the masonic lodge building was unimposing, and did not command any respect. Although opposed by then Prime Minister Molteno due to financial considerations, a committee was set up to receive designs for a new parliament building. The committee selected an elaborate design by architect Charles Freeman, and construction began on 12 May 1875, with the then Governor of the Cape Colony, Henry Barkly, laying the cornerstone. Almost immediately it was discovered that Freeman's plans were faulty. Freeman's errors were compounded by the presence of groundwater, and a recalculation of the budget revealed that the actual costs would be many times the original figure that the government had allowed for. For his incompetence, Freeman was fired, and Henry Greaves was appointed architect in 1876. Freeman's plans were altered to exclude seemingly unnecessarily expensive features such as a central dome, statues, parapets and fountains. Building re-commenced, but was delayed – this time by the British overthrow of the Cape government in 1878, the ensuing Confederation Wars, and finally by the building company going bankrupt in 1883. Greaves tenaciously completed the job however, and the large, stately, but relatively unpretentious building was finally opened in 1884. Cape Prime Minister Thomas Scanlen, and British Governor Henry Robinson led the opening ceremony in the building, declared finally to be worthy of the country's Legislature. In the 1920s, Parliament commissioned Sir Herbert Baker to build an extension to the building, including a new chamber for the House of Assembly. The old Assembly chamber became the Parliamentary Dining Room, run by the catering department of South African Railways & Harbours. A further extension was created in the 1980s, when the 1910 constitution was replaced with the awkward & novel tricameral constitution which provided a parliamentary house each for Whites, Coloureds, and Indians. Further constitutional changes moved the centre of power away from the old building and towards the newer wing. ↑ Phyllis Lewsen: The First Crises in Responsible Government in the Cape Colony. University of The Witwatersrand / Argief-jaarboek vir Suid-Afrikaanse geskiedenis. 1940/3.